Don't leave home without this card! 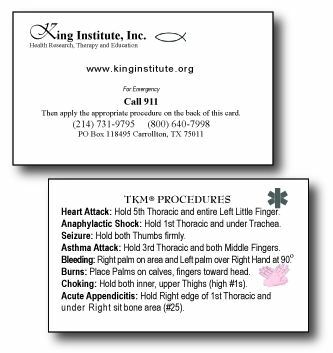 This thick laminated (like drivers license) business-card size EMT procedure reference on one side and the King Institute's contact information on the other side. The EMT procedures include how to stop a seizure, choking, bleeding, heart attack and more. This card will help you understand what to do in an emergency episode. To make sure this information will remain available to you when needed, we made it durable enough that it should never wear out.